Today about leakage in reflected UV photography and how to detect it. 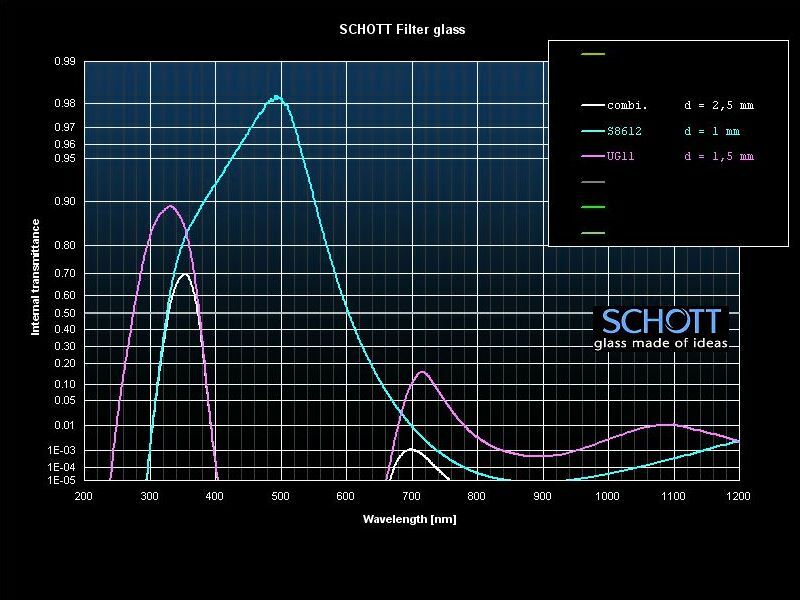 When I started many years ago, non-UV leakage effects in supposedly purely reflected UV photography was a big issue before the now "standard" UV transmission filter, the Baader-U filter was brought to the market by the company Baader-Planaterium, Germany based on intensive research of astronomer Mr Thomas Baader, who combined Schott filter glass with a multilayered, dichroic overcoating to suppress IR leakage. 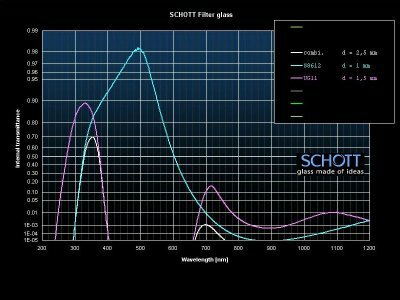 The method before was using for instance filter stacks consisting of a IR leaking UV filter, SCHOTT UG1 or UG11, plus IR suppressing SCHOTT S8612, BG38 or BG40 filter glass. The downside was, that the suppression was far from being optimal and under certain shooting conditions one could get massive IR leakage. 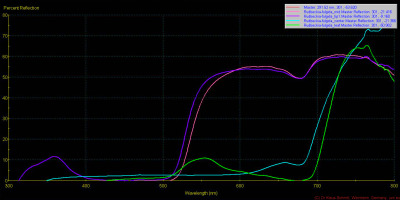 It takes a bit of experience to see that though and even today one can see a lot of such supposedly "UV images", but basically it is a mix of UV and near IR (NIR), if not often nearly purely NIR. Remark: the actual color is irrelevant, as based on the whitebalance used, it could be basically any color. Important only is the intensity of these petal parts, which should be quite low, but isn't. Here another example for that, again Baader-U was used on the left image, middle and right are filter stacks (it is the same image, just differently white balanced). All these images were shot using my UV camera and a flat, beyond 300nm transmitting CERCO f4.1/94mm quartz fluorite lens. 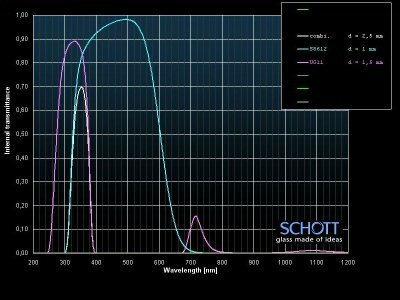 A hint and a simple explanation: a classic transmission chart of a filter in 0-100% linear scale does not show possible leakage issues. 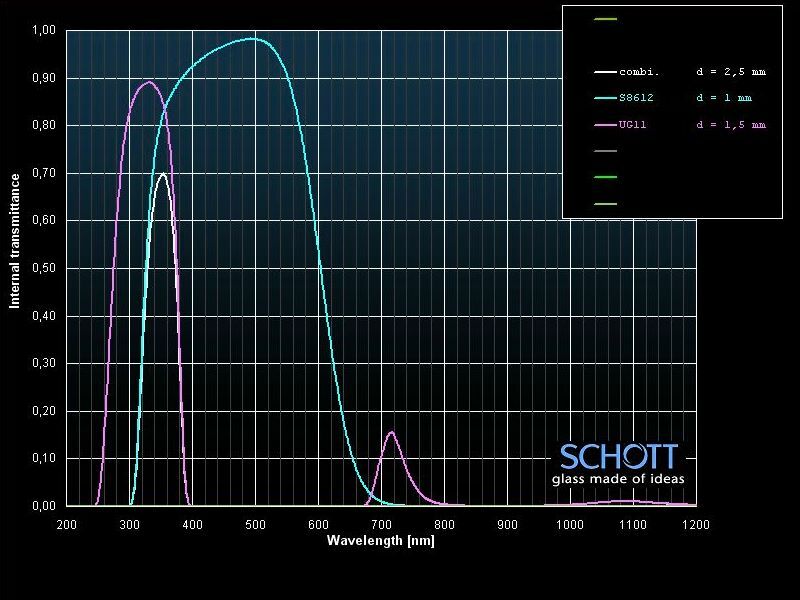 The exposure difference between UV photography and VIS/NIR photography is in the range of 8-12 exposure stops more for UV, so if a filter transmits in the VIS or NIR region more than OD3 (1E-03 or 0.001) it will most likely leak, since 10 stops equal a factor of 1024 i.e. 2exp(10), so 1/1024 = 0.001 that means a normal exposed UV image at -10EV and one through a filter that transmits 0.001 will be about equally exposed. But 0.1% in a linear 0-100% chart is pretty impossible to see, or can you see it here? It is the same example as shown above, just in the usually presented linear graph, so be aware. There is a continuation of this article HERE.